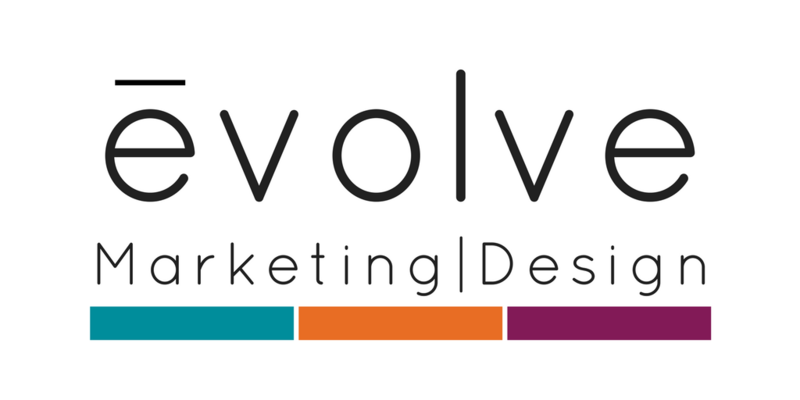 When I started this marketing & design business earlier this year, I thought I knew a lot about branding. I’ve studied it in school, after all! I’ve worked in several businesses with very strong brand identities. But the more I learn about branding, the more fascinating it becomes. I love it even more. 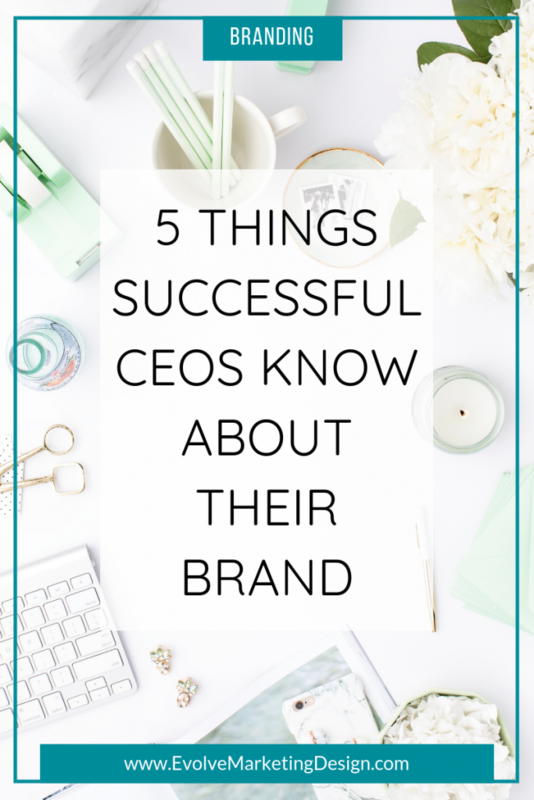 I’ve distilled down months of reading and research to five things that successful CEOs know about their brand … and how you can implement each of these things in your own business. Once you nail these five aspects of your brand, you will catapult your brand to new heights and reach more of your ideal potential clients with a clear message and an aligned brand. #1 Why they exist as a business. The best CEOs know their company’s mission and vision by heart—and their teams do, too. And, their vision likely includes a higher purpose than just selling widgets and making a profit. They have clarity, focus and a purpose that guides all of their business (and branding) decisions. Your mission statement is why you exist, and can include what you do and how you do it. It can include your values and who you serve as well. Here’s a quick primer on writing your mission and vision statements. #2 Who their audience is. 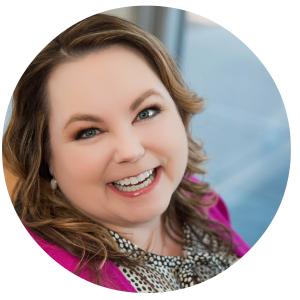 Last week I was listening to Amy Porterfield’s podcast where she was talking with expert blogger Julie Solomon. Julie said something like, “if you’re talking to everybody, you’re talking to nobody.” Wow! That really hit me. It’s crucial to drill down to your ideal client (aka ideal client avatar or ICA), to really get to know him or her. Some businesses get so detailed, they name their avatar, know what magazines she reads, what she buys at the farmer’s market, and where she lives. Super detailed! Then you know exactly who you’re writing to and speaking to. Who’s your ideal client? Frankly, I’m always refining and re-defining my ICA. One of best pieces of advice I’ve gotten is to think about your favorite past client. The one you wish all clients could be. And then use that real-life person to create your avatar. 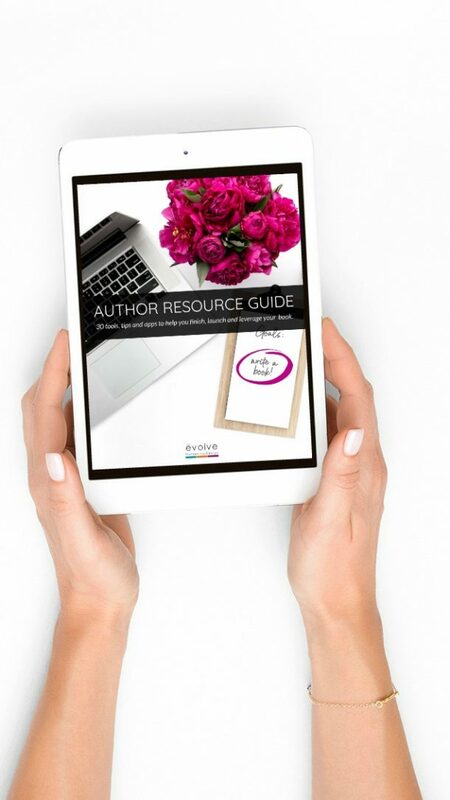 Here’s a resource from the Think Creative Collective blog I found helpful. Once you know her or him inside and out—and fall in love with them as Tony Robbins suggests—everything about brand becomes a conversation with them. #3 What comprises their brand. Successful CEOs understand that a brand is more than their logo or company name—in fact, it’s a lot more! Your brand is how you affect people; what they think, feel and say about you; and what you stand for. And yes, the visual branding elements like a logo, colors, typography and style you use to support and convey your brand to the public are part of the brand. A brand is an implied promise to its customers, and those customers’ expectations. Think about some of your favorite brands and what you expect from them. Nordstrom promises, and I expect, stellar customer service and high-quality merchandise. BMW promises, and I expect, a high-performing driving machine. Sprouts Market promises, and I expect, fresh, quality natural and organic food in an uncomplicated shopping experience. As a business owner, it’s easy and fun to focus on getting the right logo, having a great looking website, or posting color-coordinated images on Instagram. All of these are part of your brand, but they’re not your brand. Take some time to think about and write down all of the other aspects of your brand: how do you want people to feel; what memory do you want them to have; the promise are you making to your clients; the values you stand for; what is the total experience you want your clients to have. 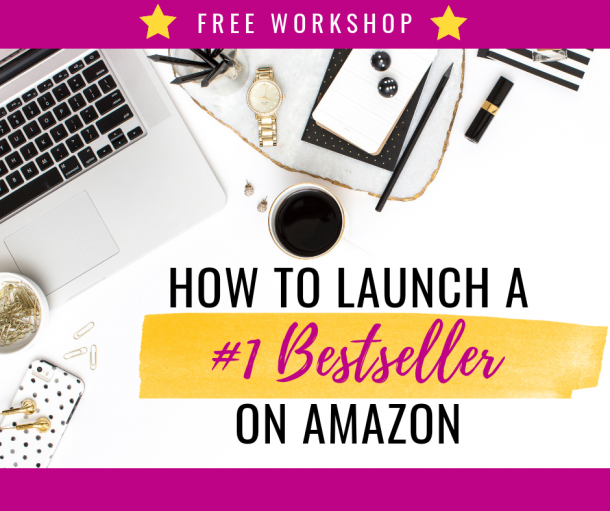 Now you’re on the road to building your irresistible brand! #4 How their brand aligns across all channels. When I read this quote from Twitter co-founder and CEO Jack Dorsey, I think of a seamlessly aligned brand. Meaning, each touchpoint that your followers and potential clients come across is similar in look and feel. They know your stuff when they see it, essentially. 1. You need to know what your brand elements are. A brand board is ideal for this. 2. You need to know where you are! 3. 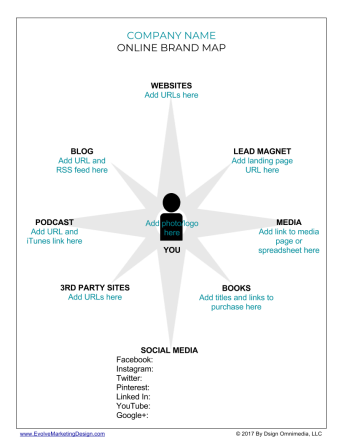 Then you need to ensure each of the touchpoints in #2 are aligned to your brand. 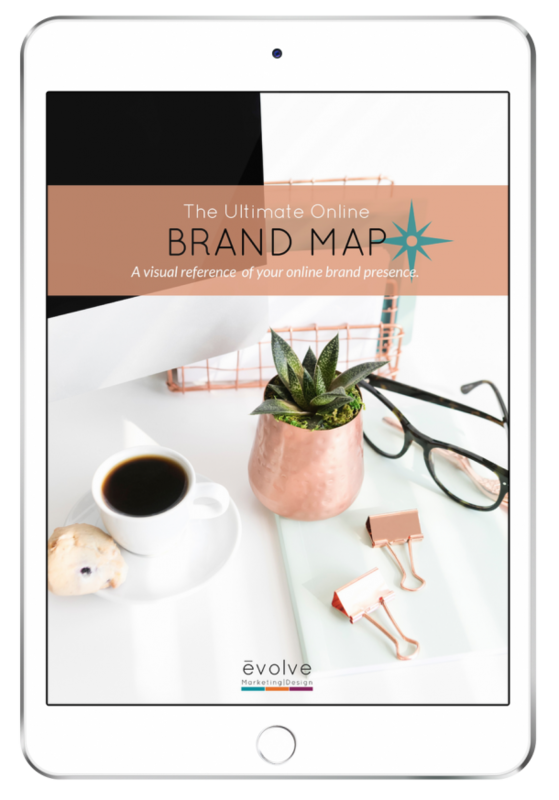 To help you find yourself online, and keep track of your overall online presence, I developed The Ultimate Online Brand Map. 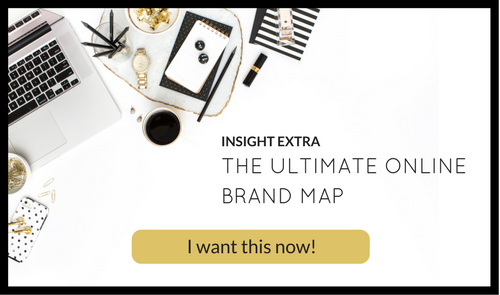 You can fill out the map template and customize it your business and online presence—and then use it to ensure each of those points is on-brand. Honestly, I use mine at least once a day, to find a URL or a social media handle. #5 How they’re perceived in the marketplace. I love this insight from Amazon’s founder and CEO Jeff Bezos. We can work on our mission statements, speak to our ideal clients, perfectly align our branding elements … and none of it matters if no one is listening, or worse—if our potential customers and clients think, say and feel the opposite of what we think our brand conveys. If you’re not already tracking your online reputation, now is a good time to start. Here are three things you can start doing right away to see how your business and brand are perceived. Set up a Google Alert for you and your business. (Click here for step by step instructions.) Google will look for your search terms and send you snippets with links to stories and other online mentions. Monitor your social media accounts for direct messages and visitor posts. Respond right away to any questions or negative feedback. Survey your email list, Facebook fans and existing/past clients. Ask them what attracted them to follow you and/or work with you; what they enjoy about you/your product or service; and what you can improve. Free survey services include Survey Monkey and Typeform. So there you have it! Five things that successful CEOs know about their brand—that you can implement in your business right away as the successful CEO that YOU are. … and a lot more! Simply enter your details below and I’ll keep you updated as the course is finalized and ready to enroll—and a few goodies and surprises, too!